After the medicals, he will be unveiled as a Juventus player inside the club’s Allianz Stadium at 5.30 pm UK time. 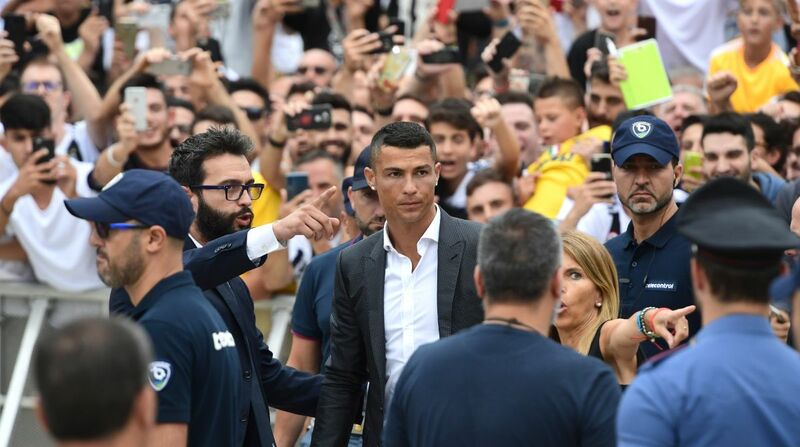 Thousands of enthusiastic and eager Juventus supporters greeted five-time Ballon d’Or winner Cristiano Ronaldo on Monday (16th July) as he arrived at the club’s medical centre to complete his £100million move from Spanish football club Real Madrid. Italy celebrated the day in a big way with #CR7Day trending across the globe. After reaching Juve’s medical centre, Ronaldo signed autographs for some of the waiting crowd. And as CR7 walked back into the medical centre, he could be heard chanting ‘Juve, Juve’. Real Madrid’s all-time highest goal scorer Ronaldo touched down in Turin on Sunday evening and reached Juventus medical centre on Monday morning for his medical tests. Meanwhile, the 33-year-old footballer is due to meet Juventus manager Massimiliano Allegri and his teammates after formally completing his transfer from Real Madrid.